EMU applauds success of renaming street in honor of Martin Luther King Jr.
As you read Preston Knight’s excellent report on the naming of a major downtown street as Martin Luther King Jr. – republished here by permission of the Daily News Record – you may be interested to know that EMU participated in that effort, with its campus pastor, Brian Martin Burkholder, serving on the task force that successfully urged Harrisonburg’s city council to rename Cantrell Avenue after Martin Luther King Jr. The leader in this renaming effort, Stan Maclin, got to know Burkholder during EMU’s January 2013 cross-city activities of “service and learning” in honor of MLK. Maclin then invited Burkholder to join him on the task force. Now another EMU staffer, Amy Knorr of the Center for Justice and Peacebuilding, has joined Maclin and Burkholder for ongoing work at racial justice and reconciliation in a group called the MLK Jr. Way Coalition. Remarks by EMU President Loren Swartzendruber at the dedication of Martin Luther King Jr. Way follow Knight’s report. 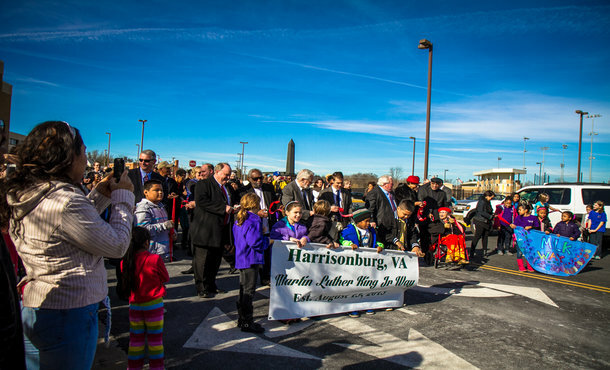 Stan Maclin, while urging Harrisonburg officials last year to name a street after Martin Luther King Jr., said the “eyes of the nation” were on the Friendly City. 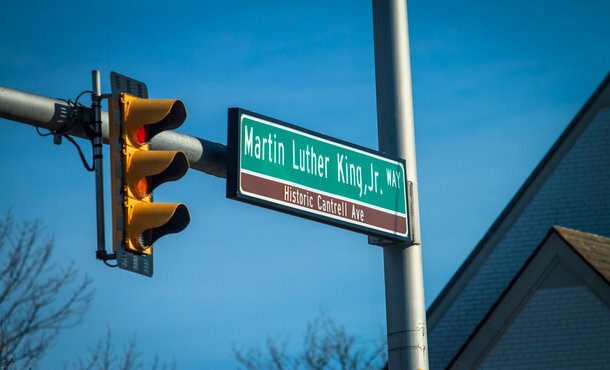 It may felt like hyperbole, but then Cantrell Avenue was renamed to “Martin Luther King, Jr. Way” and the letters of support began pouring in. They came from mayors in Baltimore and Memphis, from James Madison University graduates living elsewhere and from churches in the Shenandoah Valley. U.S. Sens. Tim Kaine and Mark Warner, both Virginia Democrats, also gave their written support, and The Associated Press made mention of the renaming in a recent story. So, Maclin was right then. For several hundred people who heard him speak at an official renaming ceremony Monday, they hope the city resident also is right about the significance of the event. The city and a group of residents, called the Martin Luther King Jr. Coalition, hosted the ceremony, fittingly on Martin Luther King Jr. Day. Several speakers highlighted the need to follow “King’s way” of living, and not just the avenue formerly known as Cantrell. “We can achieve more and have a better life if we value each other and if we work together,” JMU President Jonathan Alger said. Cantrell officially assumed its new name on Jan. 1. City Council approved the change in August, about six months after Maclin proposed honoring the slain civil rights leader in Harrisonburg. A “people’s inspired movement” should get credit for effecting change, he said Monday. “This city is unique and it has something other cities across this country do not have, and that is such a vast array of diversity,” Maclin said. Councilman Charles Chenault, 61, a lifelong Harrisonburg resident, said the name change was but a “down payment” on giving back to those who faced discrimination, particularly elders of Newtown, the city’s Northeast neighborhood and an early settlement for freed slaves. That group, he said, includes Doris Allen, 87, a 1945 graduate of what’s now the Lucy F. Simms Continuing Education Center. Although she didn’t mention it while speaking to the crowd on Monday, she has previously talked about living at a time when black women entered Harrisonburg drugstores, the theater and the hospital from the back of the building. A year ago today, which was Martin Luther King Jr. Day in 2013, Allen was celebrating President Barack Obama’s inauguration to a second term as the nation’s first black president. “We may still have a long way to go, but we’ve come a long, long way,” she said last year. The street renaming would seem to bring Harrisonburg and, as Maclin correctly stated, the nation along even further. it prays for those who persecute it. 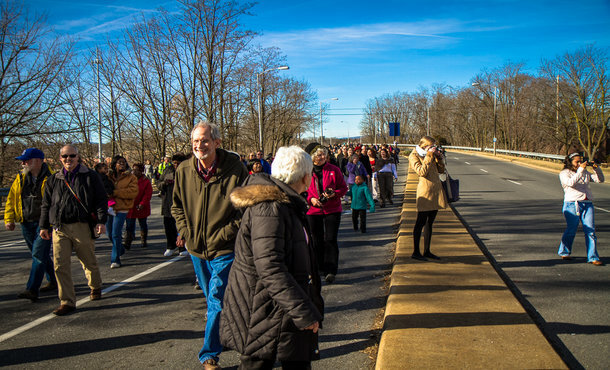 Here we gather in a community demonstration of solidarity all too rare in our polarized and divided society. I am proud to lead the first [historically white] university in the Commonwealth of Virginia to enroll students of color. Martin Luther King would have been pleased that my predecessors stood up to the prevailing opposition of their time to such a move. In the context of our current divisions I take great courage from Dr. King and from others who dared to stand tall in the face of conflict.